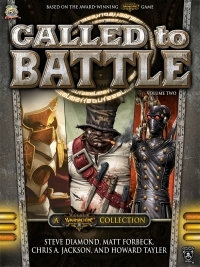 Called to Battle: Volume Two is a collection of stories focused on the Iron Kingdoms’ greatest heroes, its skilled mercenaries, and even the horrifying villains who haunt its darker reaches. Journey with High Paladin Dartan Vilmon as he and his paladins fight their way across western Immoren on a most holy mission in “Conviction” by Steve Diamond. Witness the infamous alchemist and inventor Gorman di Wulfe use his staggering intellect to try to escape the consequences of a murder accusation in “A Casualty of Science” by Matt Forbeck. Trace the origins of one of the most feared members of the pirate ship Talion, the sawbones and ship’s cook known as Doc Killingsworth, in “Flesh & Bone” by Chris A. Jackson. Discover the terrifying surgical augmentations of the enigmatic creatures called the Cephalyx as they perform their ghoulish experiments on a captured squad of Cygnaran trenchers in “Mind Over Matter” by Howard Tayler. For more great Iron Kingdoms fiction, download Called to Battle: Volume One, featuring stories by Larry Correia, Erik Scott de Bie, Orrin Grey, and Howard Tayler.